AXT is pleased to announce that they have recently signed a distribution agreement with LUMICKS (Netherlands) that further strengthens their life science product portfolio. This agreement has AXT introducing LUMICKS’ optical tweezer product lines to Australia, products that will be of great interest to researchers involved with proteomics, genomics and drug discovery. 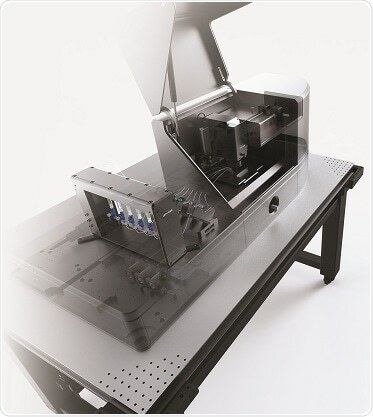 LUMICKS products are microscope-based optical tweezer systems with microfluidics used for Dynamic Single-Molecule (DSM) analysis. They offer extremely high force sensitivity (<0.1 pN) and stability with ultra-fast sensors for the analysis of single molecule events involving DNA, RNA and proteins. The product line up is headed up by C-Trap now in its second generation which includes up to four optical traps and optional fluorescence imaging, either through traditional confocal or super resolution by addition of STED (Stimulated Emission Depletion) imaging. It is ably supported by m-Trap that offers the same analysis capabilities in a none imaging two trap system. Furthermore in the next few months LUMICKS will introduce 3 new imaging modules for their optical tweezer line to accommodate ultra-stable surface assays at the single-molecule level. The LUMICKS optical tweezer systems are suited to the rapidly increasing number of biological researchers interested in observing changes at the molecular level. In particular, they add value to researchers working in areas such as DNA/RNA-protein interactions, protein folding and conformational changes, cellular structure and transport, drug discovery and development as well as immunology. We are extremely proud of our products including C-Trap which, for the first time, makes it possible in real-time to sense the smallest biomolecular changes and the rarest and most transient molecular states that are responsible for generating a plethora of diseases, such as Alzheimer's". Our mission is to put leading-edge solutions into the hands of Australian researchers. The LUMICKS products fit this brief perfectly and will allow them to accelerate their research by enabling them to study dynamic biomolecular processes in real-time with unprecedented levels of detail, potentially unlocking cures to diseases and ailments." The LUMICKS products lines complement AXT’s existing product lines in particular protein structure/crystallography systems from Rigaku Oxford Diffraction and protein analysis and formulation solutions from Unchained Labs and TTP Labtech. AXT will present the LUMICKS product lines for the first time in Australia at the Australian Biophysics Association Symposium (Melbourne, December 2-6) and the 38th Annual Scientific Meeting of the Australasian Neuroscience Society (Brisbane, December 3-6).